Jennifer Loring's short fiction has appeared in numerous magazines, webzines, and anthologies, including Crystal Lake Publishing’s Tales from the Lake vol. 1. She has also published a novella, Conduits (DarkFuse, 2014), and two novels, Those of My Kind (Omnium Gatherum, 2015) and Firebird (Limitless Publishing, 2015). 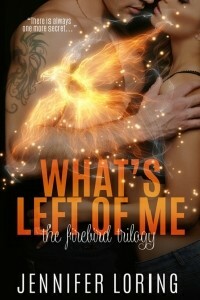 What’s Left of Me (The Firebird Trilogy #2) releases in July 2016. Jennifer lives in Philadelphia, PA with her husband, their turtle, and two basset hounds. I knew when I finished Firebird that Alex’s story was far from over, so last summer—before I had begun submitting to publishers—I made a vague outline for two more books. The sexual assault allegations against Chicago Blackhawks’ star Patrick Kane, as well as the music video “Let Them Talk” by Russian pop singer Katyla Lel and starring her friend Alexander Ovechkin (Washington Capitals captain), inspired a great deal of What’s Left of Me. Horror, dark fantasy, paranormal romance, non-fiction. Irrylath from Meredith Ann Pierce’s The Darkangel Trilogy; Constantine from Robin McKinley’s Sunshine; Zach from Poppy Z. Brite’s Drawing Blood; Gimli from J.R.R. Tolkien’s The Lord of the Rings; the vampires of J. R. Ward’s Black Dagger Brotherhood. What are you working on at the moment, and what will see from you in coming months? I’ve finished the first draft of the final Firebird book, which does not yet have a title and won’t be out until next year. I’ve also been working on some new short stories for anthologies. Several other short stories and at least two novellas are scheduled to be released this year. He’s married to the love of his life, expecting a daughter, and has a new job as an assistant coach with his old team, the Buffalo Gladiators. His happiness is short lived, however, when a sexual assault allegation surfaces, and Alex is forced to cooperate with an investigation for a crime he didn’t commit. Stephanie’s stress level goes from bad to worse when she’s diagnosed with a serious illness. Battling declining health and the critics who question her commitment to Alex in light of the allegation, she makes a decision that could change their relationship forever. Devastated that his life is spiraling out of control again, Alex turns to his friend, Natasha, a Russian pop star. Convinced that Stephanie and her friend Brandon are having an affair, Alex resumes his self-destructive behavior. What Alex doesn’t know is Stephanie has been conducting a secret investigation of her own. She learns the truth behind the sexual assault—a truth no one, especially Alex, expects. With everything now out in the open, can Stephanie and Alex commit to a fresh start for the sake of their daughter, or will the ghosts of their pasts finally tear apart everything they have left?